Green means go, especially when it comes to kale. The vibrant green color of kale means it is full of health benefits. For example, the vitamins and minerals found in kale serve as anti-inflammatory agents, immune boosters, and aid in cancer prevention. 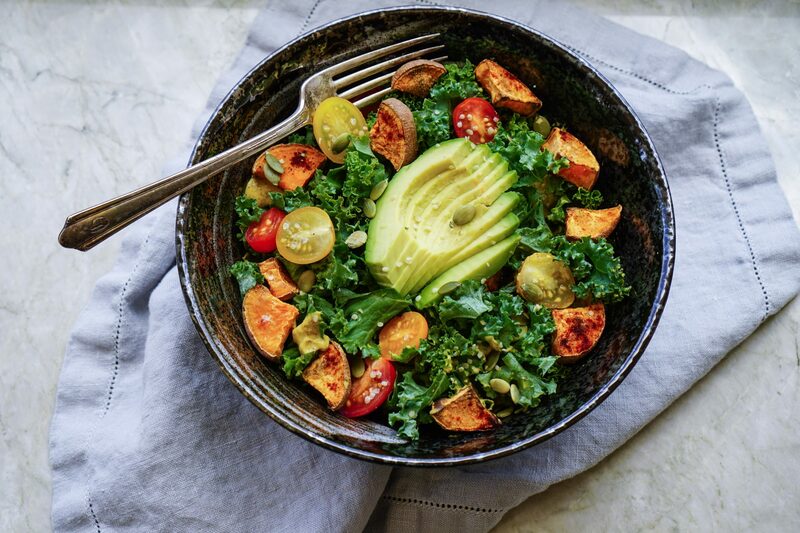 Kale is also rich in antioxidants that help protect the body from damage caused by cell death and is a natural detoxifier, helping clean the body from impurities. The high fiber content in kale aids in digestion by trapping cholesterol, preventing it from building up in the walls of the heart. The garlic in this recipe will add to the heart-healthy benefits of the kale by helping to expand the blood vessels, thus lowering lower blood pressure. Black kale is just a different variety that will be more tender when cooked, but still has the same nutritional value. This take on the classic caesar, features kale instead of romaine. Grilling the kale adds nice flavor. You could even make your own croutons. It’s not just the orange vegetables that help you see better in the dark, green ones do too. Kale is rich in vitamin A, which prevents vision loss. Lacinato kale is also referred to as dinosaur kale because it is larger than the common variety and often used in Italian cooking. Use a vegetable peeler to shave fresh Parmesan cheese on top of this rustic pasta dish featuring sun-dried tomatoes, turkey Italian sausage, and steamed kale. Need a side of greens to go with dinner tonight? Look no further than this braised kale which is sure to bring some color to your plate. With a shake this good, who knew it would be considered healthy, it’s not even green. Kale serves as a nutrient booster along with wheat germ and raspberries, both high in folic acid needed for new cell growth. Kale chips are in this season. These chips can be stored up to one week in an airtight container, making them the perfect light snack. The combination of spinach and kale adds a double dose of health benefits. Both are have loads of vitamin E which help prevent memory loss and vital for brain function. This would work great as a Meatless Monday recipe, and could even have for lunch the next day. Have you ever tried braising kale? This can even been done in a slow cooker and be ready to serve as a side dish for dinner. Kale is also a good source of calcium and vitamin K, needed for strong bones.